After yesterday's even later finish, we again didn't set off walking from Shenavall until almost 9:30am, after having striked camp and left our overnight gear in the bothy for the day. We crossed the two rivers easily as there now hadn't been any rain since Friday evening. At Larachantivore we noticed that there was a small emergency shelter, which I imagine would be very useful if the rivers were in spate. 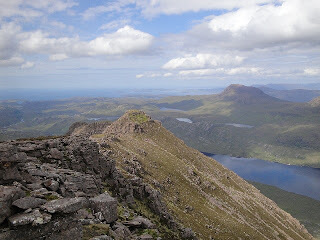 We took a rightwards trending traverse up over heather to reach the foot of the east buttress of Beinn Dearg Mor. The scrambles guidebook contained a pleasant sounding grade 3 ** scramble up the east buttress, which we thought we would have a go at. The first few outcrops were quite steep, so we turned the majority of them on the left either via heathery slopes or some easy scrambling. After a while we reached the foot of a much larger buttress, but we couldn't find the route described in the guidebook, so we again turned this on the left. Eventually we reached the ridge above this buttress and scrambled along the ridge. At one point, I found the exposure too great to the right so I opted to skirt round to the left whilst Ben continued along the ridge. We now reached a small col and concluded that the onwards route looked too exposed and wet so we instead headed up left up grass and scree to reach a level area on the ridge. By now it was 1:30pm so we stopped here for lunch with excellent views over to An Teallach. We hadn't actually ended up doing very much of the scramble and instead had a rough steep ascent over heather, boulders, grass and scree, but at least we were now almost at the top! After a quick detour to the East Top of Beinn Dearg Mor (Corbett Top), we continued with good views down to the huge northern cliffs as we followed the rim of the coire and reached the airy summit of Beinn Dearg Mor (Corbett) at around 2:15pm. The views were again excellent as the cloud remained above the summits and it was dry, although not sunny. The descent down the NW ridge was unpleasantly steep, although there was a path down through the scree. At the bealach we left our bags and headed up the south ridge of Beinn Dearg Bheag. The lower part of the ridge was relatively gentle but the upper section involved picking a route through scree and small outcrops. We reached the spectacularly situated summit of Beinn Dearg Bheag (Corbett) soon after 3:30pm just as the sun was coming out. The views from here were some of the best of the trip, especially along the NNW ridge and out to sea. We returned back down the south ridge and I spotted a well camouflaged ptarmigan amongst the scree and boulders. After reaching our bags we descended steeply down to Loch Toll an Lochain. 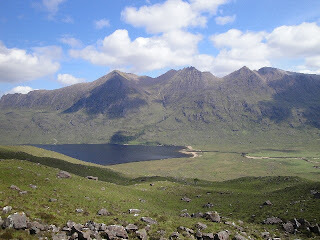 We passed to the east of the loch and continued to descend down to the path alongside Loch na Sealga. 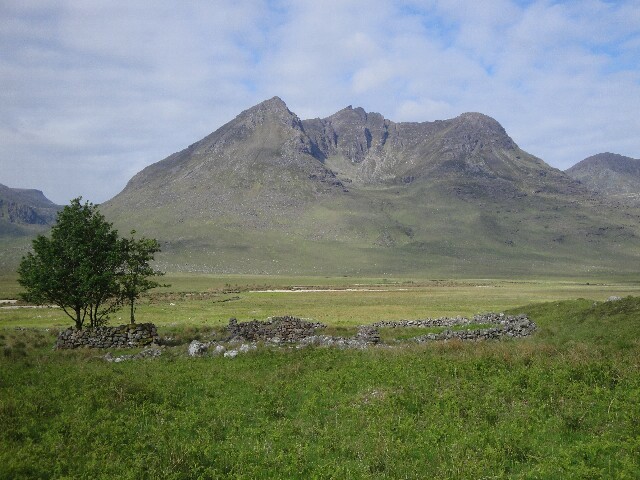 We crossed the combined rivers at the point that others at the bothy had recommended. This was the deepest crossing of the trip, with the water just above my knees in places; however with my Dry Walkers over gaiters my feet remained dry, which was good! We reached the bothy soon after 7pm, where we had a long break and our pasta dinner. At around 8:15 we set off walking again heading back to the car. The walk out seemed to go on forever and it started to rain at about 9:30pm. We finally reached the car at 10:45pm and headed back to where we had pitched on Thursday night. Another very long day!